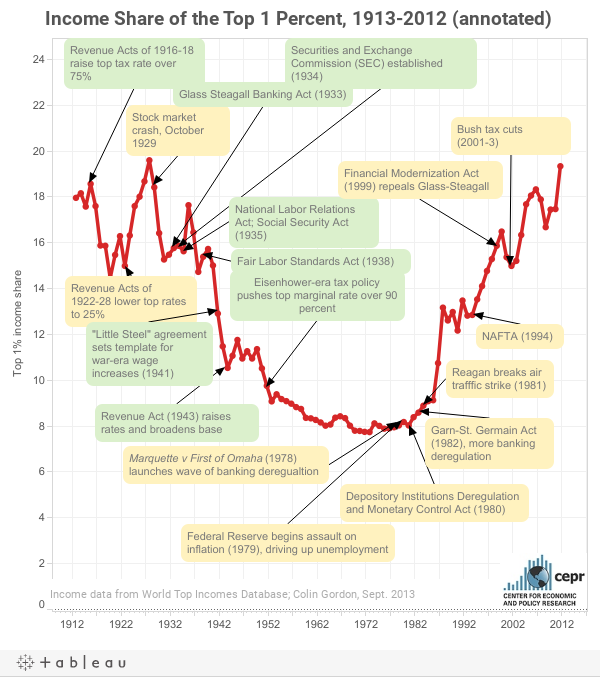 This graphic adds an annotated political history to the iconic (and recently-updated) Piketty and Saez data on top income shares in the U.S. The events and legislative landmarks listed here are representative rather than exhaustive. And they are meant to suggest broad policy shifts rather than direct causal relationships. But the pattern is nevertheless clear. The share of the top one percent rose during eras of tax cutting, light financial regulation (or deregulation), and labor weakness. And inequality narrowed when policy pushed in the opposite direction. Colin Gordon is a professor of 20th Century U.S. History, at the University of Iowa and the author, most recently, of Growing Apart: A Political History of American Inequality.